Black Friday will soon be here, and it's time for the barrage of holiday catalogs to land in our mailbox. I ignore most of them because I don't really care about kitchen tools, home furnishings or women's sportswear. However, I came upon something called Hammacher Schlemmer, America's longest running catalog. This is not a running catalog, but rather a social experiment to see if people will pay $129 for a cotton bathrobe just because it's described as "Turkish." As I read through the pages, I became increasingly appalled by these products that looked like Dollar Store rejects marked up 5,000 percent. 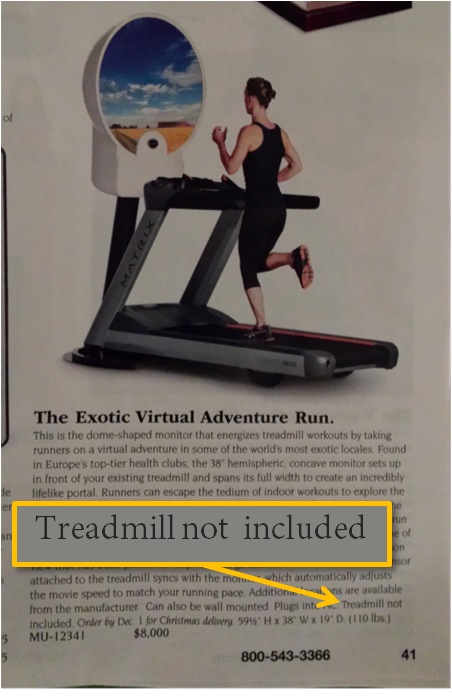 That is, until I reached page 41 that featured the "Exotic Virtual Adventure Run." This item looks like the Interocitor from "This Island Earth" (a film famously mocked by Mystery Science Theater 3000) attached to a treadmill. The description states that the system will provide a "virtual adventure in some of the world's most exotic locales." 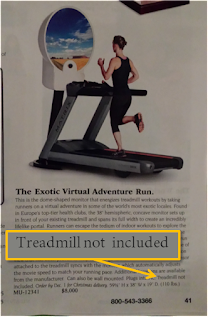 The treadmill in the picture was a Matrix, so I wasn't shocked to see the $8,000 price. I was surprised to see that this silly looking product does not even include the treadmill. Assuming you have an iPad, that money would buy 2,000 different runs (assuming that many are available) for the Outside Active Virtual Runner app. This catalog also offers a $25 cheap looking plastic tire gauge with "digital readout" and an incredibly spindly looking Elipti-Go knockoff for $999.95. I had no special gadgets on this morning's run, unless you count my Garmin. I went with short sleeve shirt under long sleeves along with running shorts, because the local news station was showing 50° in the lower right corner. I was afraid I'd overdressed, but once I stepped outside and felt the 14 MPH wind, I was grateful for the extra layer. It wasn't raining, but there was a lot of mist in the air, making for a cold and gloomy experience. Today's run was a bonus for me, made possible by the Veteran's Day holiday. Due to the miserable conditions, I decided to cap my run at around 3 miles. I was glad to get in the workout and happy when I finished. I suppose I could have accomplished the same thing in the comfort of my own home, had I purchased the Exotic Virtual Adventure Run. 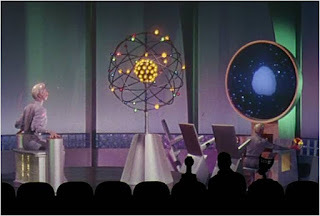 Of course, the interocitor! That's obvious. 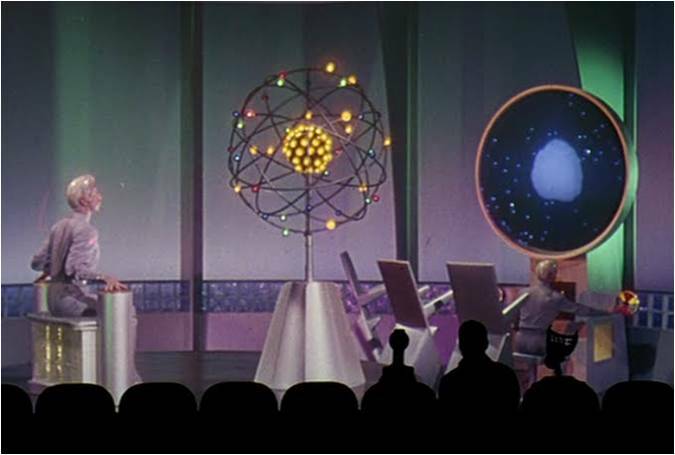 Not only does it provide the experience of running elsewhere, but you can also talk to the Monitor on planet Metaluna. I'm really hoping that Hammacher Schlemmer offers a Thought Transference Chamber next Christmas. Remind me to get you a pocket protector for your birthday. Thanks, mine just got ruined by my Interocitor. I'm putting that on my Christmas list. I wonder how well it will work with my 18 year old treadmill? Hi Wendy! I'm not a consumer economist but I'd strongly suggest that you attach this amazing alien technology to a more modern unit. Why wouldn't you wear your long sleeve shirt UNDER you short sleeve shirt? Yes, and furthermore, why wouldn't I wear running shorts over running tights? When I first read that comment I though it was from you. TPP is gettin' sassy! !